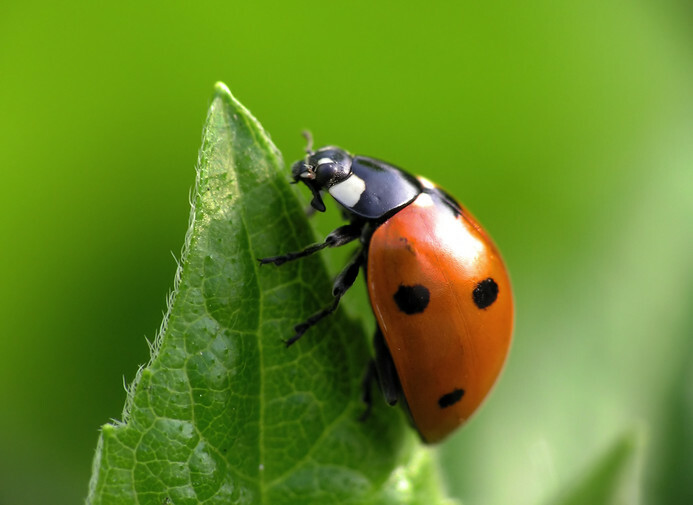 Beneficial ladybugs for controlling pests in your garden are the most popular and widely used beneficial insects for greenhouses and home gardening. Ladybugs are capable of consuming up to 50 to 60 aphids per day but will also eat a variety of other insects and larvae including scales, mealy bugs, leaf hoppers, mites, and various types of soft-bodied insects. 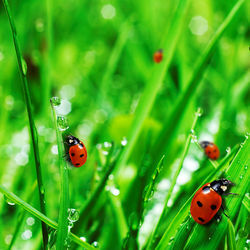 Ladybugs, also called lady beetles or ladybird beetles, are a very beneficial group of insects. 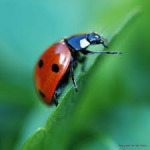 Ladybugs are natural enemies of many insect pests and it has been demonstrated that a single ladybug may consume as many as 5,000 aphids in its lifetime. Ladybug adults have a very characteristic convex, hemispherical to oval body shape. The head is covered by a hood called the pronotum. Many species of Ladybugs are present in North America and they are common in most habitats across the commonwealth. They may be white, yellow, pink, orange, red or black, and usually have spots. Approximately 1,500 Ladybugs $14.85 Fresh Ladybugs Avalable Now. Quanty two bags of 1,500 Ladybugs for $25.35 up to 2,500 sq. ft.
Large garden pint size 9,000 ladybugs $29.85 up to 5,000 sq. ft. Very large garden qt. size 18,000 ladybugs $39.85 up to 12,000 sq. ft. When you buy ladybugs from almost any other source they have been hauled all around the United States from 2 to 3 different companies. 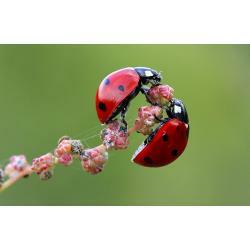 It is best to order fresh healthy ladybugs and have them delivered directly to you from a reliable source. This stresses out the ladybugs, robbing them of their vigor, aphid eating and reproduction capabilities. Other ladybugs may travel an extra 900 to 4,000 miles over 3 to 5 days or more before they reach you! Our ladybugs are shipped FedEx next day delivery or second day delivery your choice. Ladybugs are among the most familiar beetles, easily recognized by their round, often spotted bodies, less than 1/16-3/8" long. Most are shiny red, orange, or yellow with black markings, or black with red or yellow markings. Both adults and larvae are predators, mostly of aphids. They are common on plants and often over-winter as adults in large swarms under fallen leaves or bark. In the West huge swarms of Ladybugs fly into mountain canyons, over-winter under leaves, and return to the valley in the spring. If food supply is good there are many generations a year.In fact, this is a type of warning coloration to other animals that may try to eat lady beetles. Like many of other brightly-colored insects, ladybugs are distasteful to predators. When disturbed, they may secrete an odorous, distasteful fluid out of their joints to discourage enemies. Did you ever see a little red and black beetle crawling along your window sill? It was probably a Lady beetle or just Ladybug as most people call them. Most species of Ladybugs are among our most beneficial insects as they consume huge numbers of plant feeding pest insects, mostly aphids. This fact and their attractive appearance have contributed to the generally good opinion of Ladybugs by most people. For instance, the French call the Ladybugs les betes du bon Dieu or creatures of the good God. 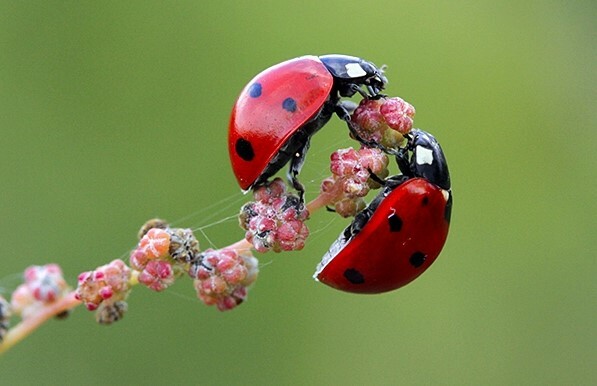 Ladybugs belong to the beetle family Coccinellidae which means "Little sphere". There are probably 4,000 species found world-wide and over 350 in North America. Received as promised and packed nicely. Released in my yard and garden early evening just after rain storm subsided. Next day I checked my garden and all the ladybugs were scattered around in the flowers. Only one dead ladybug out of the 1500. Lots of good information on this web-site. I needed some ladybugs on a very last minute notice for a birthday party. They arrived next day healty and in time for the party. The children released the ladybugs out in the garden, and it was a lot of fun to see the ladybugs all over the plants and on the childeren's hands. Great customer service on a fast delivery.